Hydrogels are physical and chemical polymer networks capable of retaining large quantities of liquid in aqueous conditions without losing their dimensional stability. They are used in a whole host of applications, and in combination with other components and they acquire specific properties such as electrical conductivity. The Materials + Technology research group in the Department of Chemical Engineering and Environment of the UPV/EHU's Faculty of Engineering selected a biopolymer that had not previously been used for applications of this type: starch. "One of our lines of research focuses on starch, and we regard it as having biological, physical and chemical properties suitable for producing hydrogels," said Kizkitza Gonzalez-Munduate, a member of the group. They created the hydrogel for use in neural interfaces. 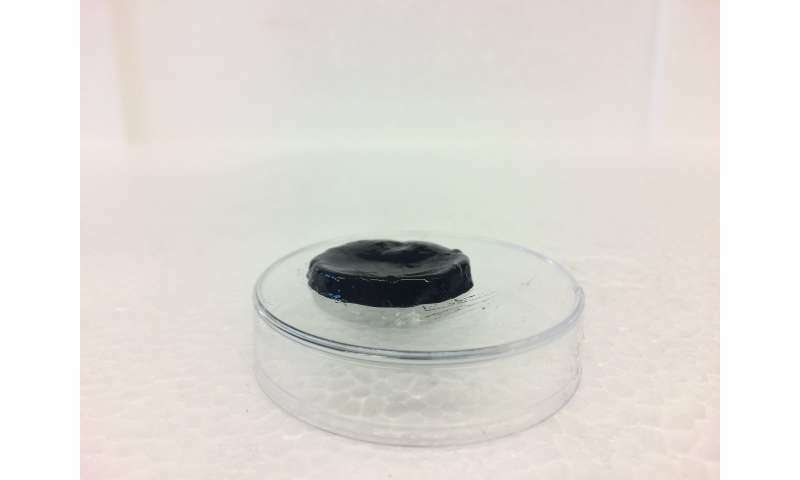 "Due to the fact that electrodes of neural interfaces made of platinum or gold are rigid, they require conductive polymer coatings to bring their flexibility closer to that of neural tissue. Right now, however, smaller devices are required that offer better mechanical, electrical and biological properties," explained the researcher. The hydrogels "address these demands very well," explained Gonzalez. To provide the hydrogel with electrical conductivity, they used graphene. "It provides electrical properties that are highly suited to the hydrogel, but this also has a drawback: It is not easily stabilised in water. We used extracts of salvia to overcome this obstacle and to render the graphene stable in an aqueous medium. These extracts also make the hydrogel even more suitable, if that is possible, for use in medicine as it also has antimicrobial and anti-inflammatory properties," she added. The researchers used "click chemistry" to produce the hydrogel. "Unlike other means of synthesis, click chemistry does not tend to use catalysts in the reactions; in addition, no by-products are generated and they are high-performance reactions," said Gonzalez. Although the hydrogel was designed for a very specific application, the researcher notes that it has a long way to go until it can be used in patients. "It was a piece of research at an initial level focussing on the engineering side relating to the material. Now, the various levels will have to be overcome and the corresponding tests designed."